You are here: Home / Care and Maintenance / Which Carpet Cleaning Method is Best? What is the best carpet cleaning method? A question that continues to be echoed among both consumers and the industry. There are a number of carpet cleaning methods that you can choose to help you to better care for your carpet. By cleaning a carpet before it becomes too soiled, the task of keeping it looking new will be much easier. While the thorough routine vacuuming of carpet will remove the majority of dry soil, wall to wall carpet still needs to be cleaned to remove the oily, sticky soil that builds up in a carpets pile as the result of tracked in unwanted soil and odors. There is a false myth that cleaning a carpet before it is necessary will result in rapid resoiling. Many years ago coconut oil shampoos were used for cleaning carpet and some of them did leave residues that resulted in rapid resoiling. Today almost all carpet cleaning products leave very little residue unless of course you have one of the new Housmile robot vacuum systems that don’t leave a trace. 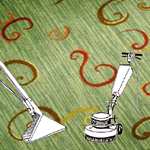 Most professional carpet cleaning methods have also been improved to reduce rapid resoiling. This improvement in technology came from an advancement made in Upholstery Cleaning, rapid resoiling was a very big issue for the upholsters and thus they found out how to solve their problem. The fact is that carpet in a typical household should be cleaned every 12 – 18 months depending on the number of people and pets living there and the amount of traffic. A good way to tell if a carpet is due for cleaning is by moving a chair or sofa so that the trafficked and non trafficked areas can be compared. While there are many do-it-your-self cleaning machines for purchase and rent, it is usually advisable to use a qualified professional carpet cleaner such as those Certified by the Clean Trust, previously IICRC – Institute of Inspection, Cleaning and Restoration. Professional rug cleaning services will have the experience to advise you of the best carpet cleaning method for your carpet. This experience also enables them to do a much better job than you can do yourself. The equipment they use has more extraction power than the units available to you, and the carpet will dry faster as well. They know the cleaning agents to use, and they know the differences in carpet construction and fibers. A number of rental companies offer cleaning equipment that is similar to what a professional will use. You need equipment that has enough vacuum power to allow the carpet to dry rapidly, preferably in less than 12 hours. It is best to avoid rental units found in many retail, hardware and grocery stores that don’t have the power to extract the cleaning solution from the carpet fast enough. Over wetting combined with slow drying can be damaging to a carpet. Avoid over wetting the carpet. Prolonged dampness combined with traffic can cause a separation of the backing. When a carpet remains wet for an extended period of time, this can lead to mildew growth and bacteria in the carpet backing. After cleaning your carpet place fans to increase air movement and speed the drying. Today most carpet has stain resistant treatments. Make sure that the carpet cleaning products you purchase are designed for the type of fiber you are cleaning. Failure to properly clean a carpet is action to void a stain resistant or carpet performance warranty. Never use cleaning or spotting solutions that contain bleaches as they can mess up the color of the carpet. Never use any silicone based treatments on the carpet. Silicone treatments are not needed and not designed for most of the carpet that is manufactured today. With all cleaning methods a wall to wall carpet needs to be thoroughly vacuumed prior to cleaning to remove any heavy soil such as silicates (the primary constituent of soil), without this pre-vacuuming, dirt and sand are forced to the backing of the carpet. It is highly recommended that you give your carpet a very thorough vacuuming prior to the arrival of the professional carpet cleaning company. While vacuuming make not of any special areas of concern and point these out to the cleaning crew upon its arrival. An absorbent granular material that has been incorporated into a mixture of detergent, solvent and water is brushed into the carpet pile with a machine incorporating a double cylindrical brush. Once the material has dried the carpet is vacuumed to remove the powder and the soil that it has captured. The best use for the absorbent powder cleaning method is the commercial installation where the carpet is cleaned regularly and requires quick drying. This carpet cleaning method in appearance is similar to the rotary shampoo method. The machine used is essentially the same. A detergent is usually sprayed onto the carpet. A rotating absorbent pad spins and agitates the carpet fibers as the soil is collected into the pad. This method improperly preferred on cut pile carpet can cause untwisting of the face pile. While this method is reasonably quick drying it must be done more often as it is more of a surface cleaning. The best use for this method of cleaning is the commercial installation where they clean regularly and require quick drying. The cylindrical foam method uses a machine with an air compressor that whips the shampoo solution into heavy foam. The foam is brushed into the carpet with a cylindrical brush. Once the carpet has dried it is vacuumed to remove the shampoo and the particles that have theoretically bonded to it. Not all of the shampoo and soil is actually captured but instead much of it is forced deeper into the pile. While this method is reasonably quick drying it must be done more often as it is more of a surface cleaning. The cylindrical foam carpet cleaning method is best in the commercial installation where they clean regularly and require quick drying. The Rotary shampoo carpet cleaning method uses chemicals similar to those used with cylindrical foam. The rotary floor machine usually has an attached solution tank for the shampoo solution. The diluted solution is fed through a tub to a “shower-feed” where it is applied to the carpet. While the shampoo is being applied a round brush on the machine is scrubbing the carpet. This shampoo method uses more moisture than the cylindrical brush method. The rotary shampoo method is not recommended for use on cut pile carpet as it can cause untwisting of the face pile. With this carpet cleaning method a non-foaming detergent is injected into the carpet fibers and is almost simultaneously vacuumed out of the carpet taking the dirt and soil with it. The extraction method when performed a skilled technician and quality chemicals will leave very little residue to attract to soil. You can use a truck mounted unit or a portable self contained unit as well. In the hands of an unskilled person a carpet can be over-wet during extraction cleaning so be sure to take extra dry passes when cleaning it yourself. Today, many carpet manufacturers require that carpets be maintained by the hot water extraction carpet cleaning method. If you have concerns with the performance of your carpet it is suggested to have a thorough professional carpet cleaned by the preferred method of the carpet manufacturer, prior to submitting a claim. While you cannot expect a 5 year old carpet to look brand new in traffic areas a Certified Carpet Inspector will be able to draw a fairer conclusion as to a carpets performance if they are inspecting a clean carpet. Thank you, we will continue to add more information. I’m trying to find the best way to clean my carpet so that it will look like new. It looks quite dirty, so I’ve tried several methods to remove all of the stains. The methods that I’ve used haven’t worked, so it helps to have a comparison of different cleaning methods. I thought that the statement about how dry extraction cleaning was rather interesting. Why is it that it’s best used by commercial cleaning companies? It seems like absorbent carpet cleaning powders should also be just as affective if it’s used by people in their own homes. Sorry you misunderstood. I was saying, “The best use for dry extraction cleaning is the “commercial installation” where they clean regularly and require quick drying.” They are cleaning before the carpet gets too dirty and the carpet dries quickly so the business can operate. Methods that use a granular dry method are actually some of the safest methods for an inexperienced person cleaning their own carpet. The problem is, if you don’t know what you are doing or you have carpet that is “quite dirty” you probably aren’t going to get it clean. I personally prefer a professional hot water extraction cleaning. That does not mean the other methods are wrong, unless the warranty on your carpet calls for a specific method of cleaning and in that case you need to take that into consideration. This article is extremely helpful and very well written. Thank you Penny. See by your address you are in the carpet cleaning business so it is nice to hear your compliment. This article is extremely helpful for the cleaning process. We are pleased that you found it helpful. Great info for the homeowner. I run a carpet cleaning business and you nailed this. Steam cleaning, in my experience, seems to out perform the hot water extraction and the other “green” methods out there. Thanks.